In 2006, even though he could barely type, China's most famous artist started blogging. For more than three years, Ai Weiwei turned out a steady stream of scathing social commentary, criticism of government policy, thoughts on art and architecture, and autobiographical writings. He wrote about the Sichuan earthquake (and posted a list of the schoolchildren who died because of the government's "tofu-dregs engineering"), reminisced about Andy Warhol and the East Village art scene, described the irony of being investigated for "fraud" by the Ministry of Public Security, made a modest proposal for tax collection. Then, on June 1, 2009, Chinese authorities shut down the blog. 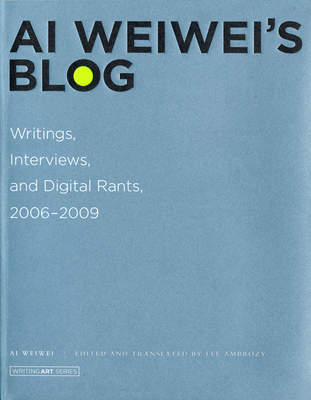 This book offers a collection of Ai's notorious online writings translated into English--the most complete, public documentation of the original Chinese blog available in any language. The New York Times called Ai "a figure of Warholian celebrity." He is a leading figure on the international art scene, a regular in museums and biennials, but in China he is a manifold and controversial presence: artist, architect, curator, social critic, justice-seeker. He was a consultant on the design of the famous "Bird's Nest" stadium but called for an Olympic boycott; he received a Chinese Contemporary Art "lifetime achievement award" in 2008 but was beaten by the police in connection with his "citizen investigation" of earthquake casualties in 2009. Ai Weiwei's Blog documents Ai's passion, his genius, his hubris, his righteous anger, and his vision for China. Lee Ambrozy is the Editor of Artforum's Chinese language website.